The primary function of any business can be boiled down to revenue growth. eCommerce businesses are no different. Companies of all shapes and sizes are always looking for the best ways to grow. As a recent study by DesignRush revealed, social media marketing investment is the top growth strategy for the majority of eCommerce businesses. In our survey, over 150 eCommerce businesses were asked questions about the marketing channels they use, including SEO, paid search ads (PPC), offline marketing, and social media. 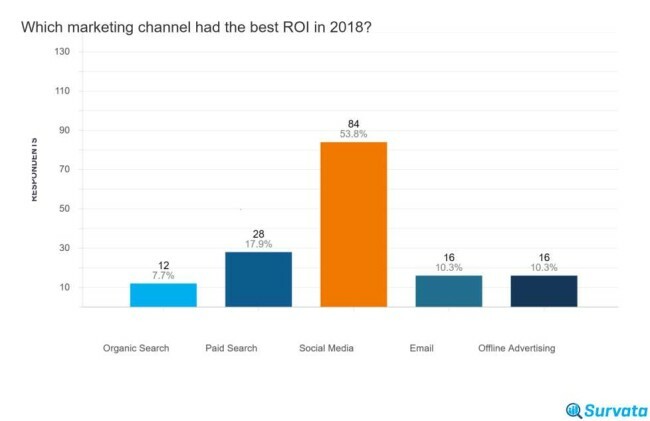 After providing information about their business, respondents were asked to weigh in on which marketing channel gave them the highest ROI in 2018, and where they plan on spending their marketing dollars in the future. Businesses were also asked about the use of marketing agencies and the difficulty they experience with the various channels. Small eCommerce businesses with less than 10 employees were the primary participants in this survey. However, to gain some greater insights into the market as a whole, we also received feedback from larger companies, some with tens of thousands of workers. Nearly half of our respondents take in less than $500,000 a year in sales, with a small percentage making upwards of $40 million. Respondents utilized a variety of eCommerce platforms in 2018, primarily their own websites, Amazon, and mobile apps. This study examines the ways that eCommerce businesses plan on growing, with a focus on marketing investments. 52% of respondents expect to see sales increase between 1% and 20% in 2019. 10% were more optimistic, planning for an even higher increase. 23% of respondents plan on increasing their workforce in 2019. 68% of companies do not plan on making any major changes to their workforce. 52% of eCommerce businesses plan on increasing their marketing budget in 2019. Social media is the primary marketing investment, with half of respondents spending more on social media than any other marketing channel. That’s more than SEO, paid search ads, PPC, and email marketing combined. 54% of surveyed companies reported that social media had a higher ROI than any other marketing channel in 2018. This percentage was especially high for businesses making between $1 and $5 million — up to 64%. 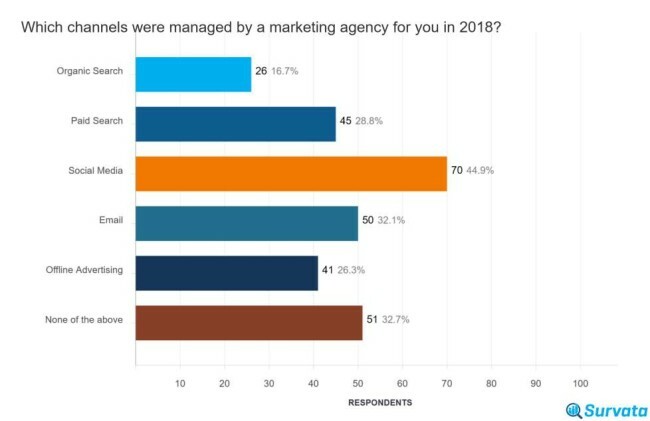 Two-thirds of eCommerce businesses worked with a marketing agency in 2018, and even more plan on utilizing one in 2019. Social media agencies were the most popular agency type in 2018. Nearly half of all respondents partnered with a social media marketing agency in 2018. This trend is set to continue into 2019. 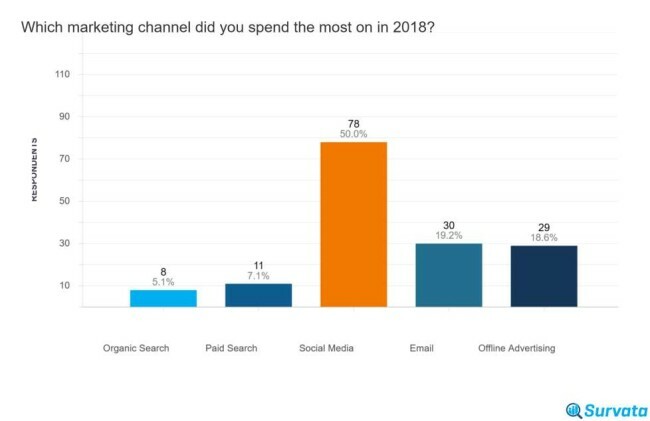 Offline advertising and email marketing investments and agency use has stagnated, with only around 13% of businesses making one of these channels their primary investment. While every eCommerce company needs to utilize a variety of marketing tools to cultivate growth, social media appears to be the clear leader when it comes to ROI. Many businesses call upon the services of a social media agency to give a boost to their social footprint, which, in turn, can fuel conversions. Let’s dive into the data to find out how eCommerce businesses are trying to cultivate growth in the coming years. 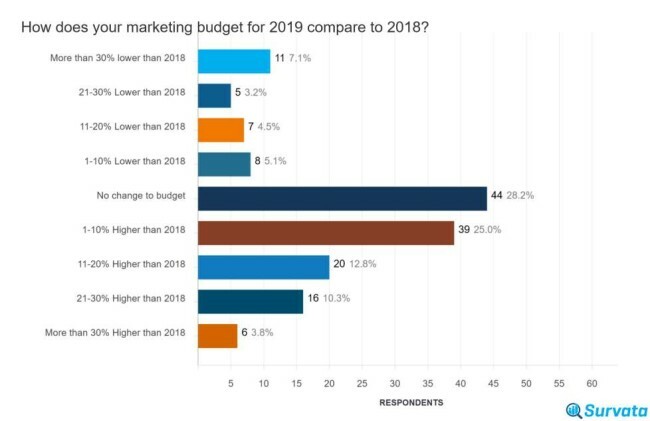 52% of respondents plan on increasing their marketing budget in 2019. The most popular budget increase was between 1% and 10%. 28% of businesses aren’t planning to change their budget at all. The remaining 20% plan to decrease their marketing budget in 2019. 50% of all respondents said that social media is their number one marketing expense. Email and offline advertising were next in line, with about 20% each. To smaller companies, social media is even more important: 61% of them spent the most on the channel. This could be explained by the low cost of social media ads — Facebook ads can be purchased for as little as a dollar a day. 48% of companies plan on social media being their biggest expense in 2019. This number jumps to 57% for companies making between $5 and $10 million. Projected spending on email marketing and offline advertising is reduced, while paid and organic search saw significant increases. Two-thirds of all eCommerce companies partnered with a marketing agency in 2018. Social media agencies were the most popular type, with 45%. Though SEO continues to be a powerful online marketing tool, less than 17% of companies used an SEO agency. 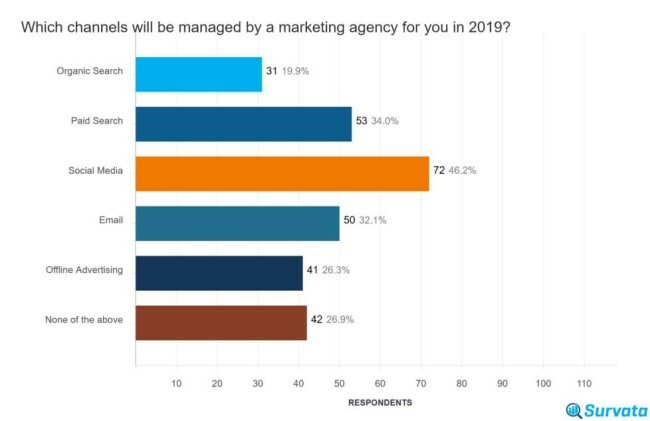 Over 70% of eCommerce businesses plan on working with a marketing agency in 2019, up 6% from the previous year. Email marketing and offline advertising stayed flat, while social media agencies saw an increase in planned utilization. Respondents are also planning on working with more SEO and PPC agencies. This is higher than all of the other marketing channels combined. According to our social media eCommerce survey, high social media ROIs are driven primarily by Facebook. This study looked into the ways that small eCommerce businesses plan to cultivate growth via their marketing investments. We found that social media marketing is the primary channel for businesses to invest in, whether it’s directly with promoted posts or through a marketing agency. To utilize social media platforms such as Facebook, Instagram, and Twitter effectively, near-constant engagement is required. Many businesses do not have the time or resources for this, which is why they work with a social media agency. 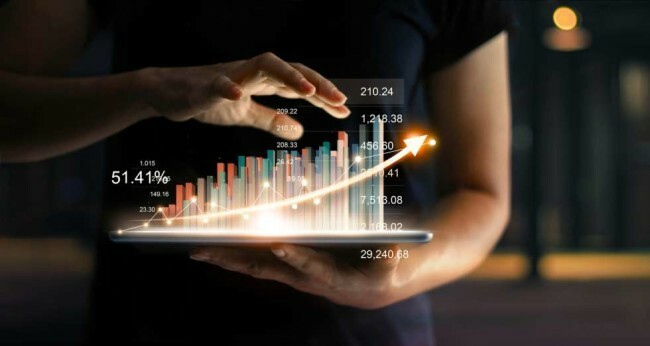 Small business growth trends in 2019 are a continuance of those going back to 2017, when nearly half of all small and medium-sized businesses planned on growing by 25% annually, according to BigCommerce. Social media is clearly the springboard for most eCommerce companies, who depend on social sharing to build brand visibility and make conversions. For eCommerce businesses looking to maximize their growth potential, our study has shown that there is no better avenue for doing so than with social media marketing. Partnering with an agency is one of the best way to invest in a marketing channel, and social media agencies exist to assist companies in perfecting their digital footprint. DesignRush provides an unparalleled agency listing service, where businesses can compare agencies by expertise, reviews, and budget. The end result is an increased revenue growth potential for businesses of all sizes. Check out our list of top digital agencies to start making the most of your eCommerce company today!